In North America over 750 species of butterflies; Georgia boasts 160. Almost any yard in GA can lure over 30 different species a year. Butterflies are great pollinators and will help all plants in your garden. You can lure butterflies to your garden if you provide Host plants for egg laying and larval stage, nectar plants for adult stage, water/moisture source and protection. – Most eastern butterflies feed at night and take refuge within folded leaves or webs by day. Each species has distinct coloring and patterns. – As caterpillar grows it sheds its skin many times. After 3 or 4 weeks they form a chrysalis. Each species has a different chrysalis. – They overwinter and emerge in spring with small, damp wings. They hang with wings down and slowly pump blood through its veins until they are dry. They then rest for an hour and then start flying. During Winter Hibernation is sometimes interrupted on warm sunny days when the butterflies emerge to fly and feed. – Identify the butterflies you hope to attract – given what each requires. – Generally they fly when temps are 60 – 108 degrees. So, situate your Butterfly garden in a warm, sunny area with wind protection. – Add stones, bricks or bare patches of ground as they act as solar collectors where they can bask in the sun and raise their body temps. – PLAN and then plant your Butterfly garden. Include a mix of host plants and nectar plants that the species you want to attract prefer. Not all butterflies like the same thing!!! Most butterflies will only lay eggs on a specific plant suited to that butterfly (i.e., monarchs only want milk weed to lay eggs.) Almost all Butterflies will eat a variety of nectar plants. – Plan for continual bloom from early spring thru late fall. With nectar plants, single flowers produce more nectar and are more accessible to butterflies vs. double blooms. – Butterflies are attracted to expanses of many different colors – so plant in groups or clumps rather than a single plant. – Don’t be too compulsively neat. Grasses offer shelter and are larval hosts to several species. If a garden is too neat it is easier for predators to find the butterflies. Be careful when removing leaves and plant debris as it could shelter a future Butterfly. Keep an area of your yard “The Butterfly Area” where you don’t rake the leaves in order to provide for homes during the winter for eggs or larva. – Several butterflies feed on rotting fruit, so incorporate a fruit tree or create a feeding station with a bucket of overripe fruit. Banana peels are an excellent treat for your Butterflies! – Provide a shallow pool with muddy edges. Several species are irresistibly drawn to minerals in mud, so use a shallow dish buried in the ground to lip level and add sand and water every day to keep the sand moist. – Do not use pesticides or herbicides in your Butterfly Habitat. – Study the list of host plants for larval (caterpillar) stage and the list of nectar for adult stage. – Keep bird feeders and bird baths away from butterfly habitat area as birds will eat the caterpillars more easily. Every caterpillar is not your enemy. Learn to tolerate a few chewed leaves. Pesticides and herbicides not only kill the pests they kill the butterflies! 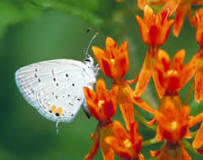 The second thing is to have lots of “nectar plants.” These are plants with flowers that adult butterflies can feed on. The best nectar plants have a large flower head or cluster of flowers that the butterfly can land on and hold to as it goes from individual flower to flower. A gust of wind could blow them off course and it would take a lot of time and energy to get back to feeding, so they like to stay put and feed. Here are some favorite nectar plants that adult butterflies like: ironweed, butterfly weed (also a good host plant), joe-pye weed, summer phlox, thrift, buttonbush, abelia, lilac, liatris, native asters, goldenrod, sunflower, lantana, Tithonia (Mexican sunflower), purple coneflower and zinnias. Buddleia or butterfly bush is an excellent nectar source.